I’m in need of some advice about my gelding, Barney. As you know, I grow a few acres of mixed vegetables and berries in Southwestern Oregon. This is my second season in business, and my second year of owning my team. Last year I used the horses mainly for discing, harrowing and rolling cover crops. I didn’t use them much on precision tasks like cultivation, but am hoping to do more of that this year as my skills improve and my relationship with my team deepens. 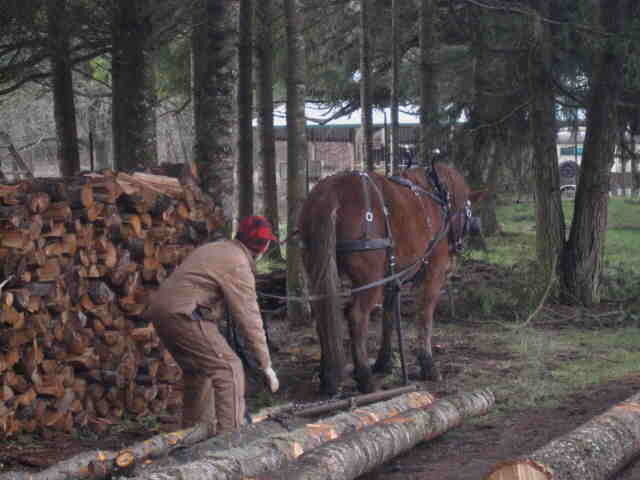 I had a great first summer of working the horses – very quiet, smooth and steady. I felt like I had found my dream team (thanks to you!). In the last few weeks as spring has unfolded, I’ve been harnessing up my team (Barney & Maude) a few times a week in order to start getting them in shape for the farm season. The first day I had them hitched, I ground drove and then hitched up to the forecart. We drove for a couple of hours and all was well. The second day we pulled a pasture harrow around the farm roads. Maude was as steady as could be, but I noticed that Barney was a little hot. He tended to want to break into a trot on the turns, and when we passed over a patch of gravel in the field that made the pasture harrow clatter, he jumped and actually kicked his hind legs up and to the outside of the traces. He was responding to pressure-release driving technique, but was definitely keeping me on my toes. I checked his harness and bridle multiple times to make sure nothing was making him uncomfortable, and as far as I could tell, things were normal. No rub or pinch spots that I could find, though I’ve since determined that his collar is too big, which means the line of draft might be a little low on his shoulders. Nonetheless, he hasn’t demonstrated any soreness on his shoulders in the past few weeks. 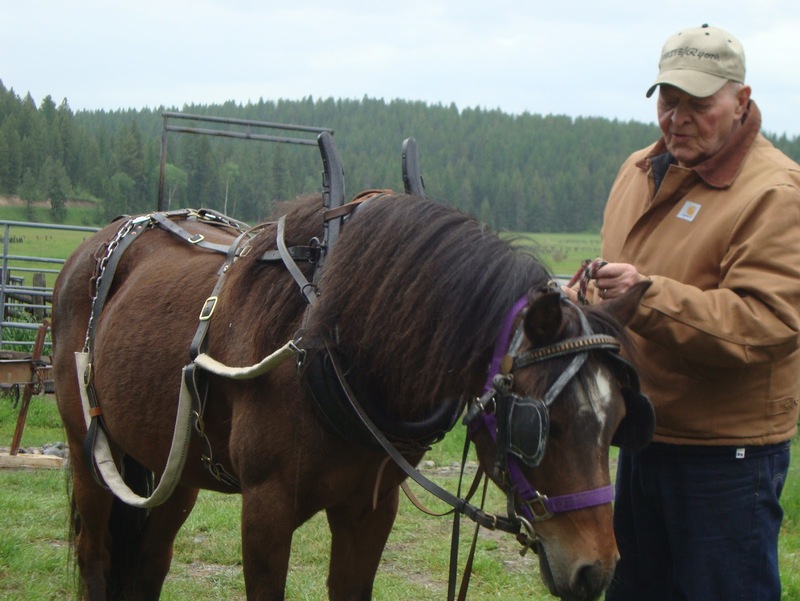 I use a 7″ snaffle bit on him, which he seemed to respond well to last summer. The third day we hitched to a disc to work in some rye/vetch cover crop. All was well for the first hour, but then, as you know, I had a run-away with them – which fortunately ended with no one getting hurt. That’s a whole story unto itself, but even after replaying and analyzing the experience with you and other teamsters, I realize I am still a bit shaken up by it. 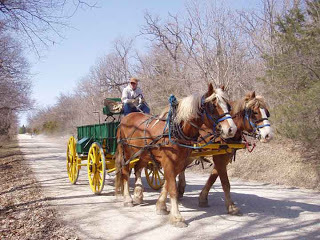 I had some trepidation when I went to hitch them after the run-away, so I took it slow with harnessing, then ground driving, then hitching to the forecart. Again, it was a pretty smooth day with no signs of fear or concern from the horses. 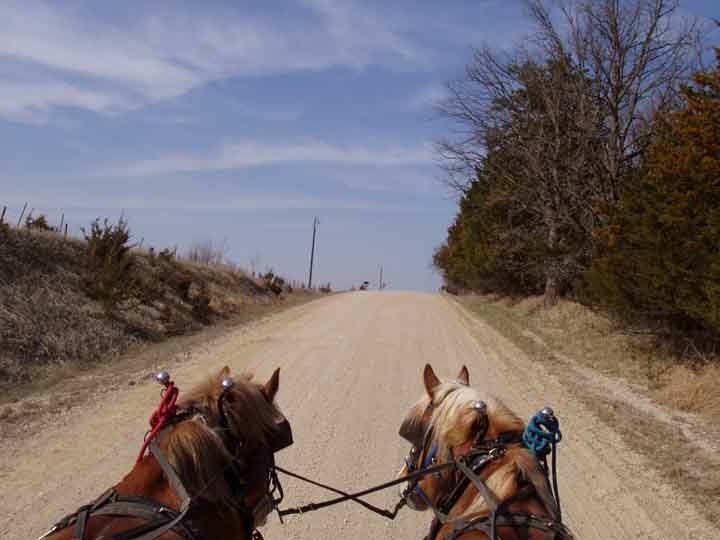 Barney was trying his trot maneuver on the turns again as I drove the farm roads around my fields, and definitely trying to move faster than Maude in general. Pressure release helped, but not enough to get him working as quietly as Maude. 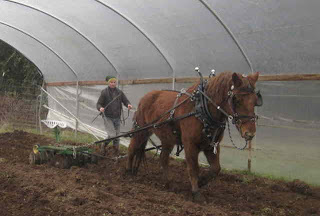 Since then, I’ve been experimenting with hitching to a new straddle row cultivator I have, and even doing some single line cultivation of my asparagus. I very quickly learned that the Danish S Tine sweeps I have on the cultivator were digging too deep and making it a really hard pull for the horses. In response, they would try to power into the pull and move too quickly. Again, Barney was hot and Maude was mellow – but I was willing to attribute at least part of his behavior to the tough pull. Also, the farm roads are lush with grass right now, which I imagine might be a bit of a torment to a horse who’s been eating hay in the barn all winter. 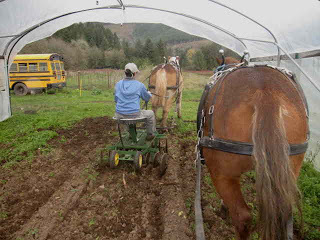 I adjusted the depth of the cultivator and tried again the next day. It was better, but Barney was highly sensitive to my start command, and even with my best efforts to start them evenly, he would try to step out ahead of Maude and set a pace that was faster than I wanted. 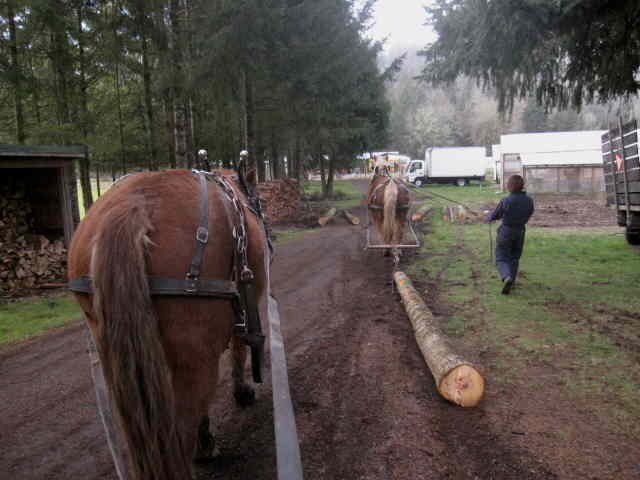 Again, he was also trying to trot when I turned them (particularly when he was on the outside of the turn). 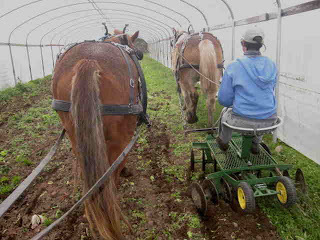 I would cultivate a row, and then do a lap around the field, practicing starts and stops, letting them settle, etc. They responded beautifully to a whoa and my stop command, but still Barney wanted to bounce into a trot from time to time. It was frustrating b/c when he would begin bouncing or trotting, I was using every technique I’ve learned from you: pressure release (including, long firm see saw strokes, double pre-whoa pressure pumps (you know when you go “easy (pump with both hands), easy (pump with both hands), whoa”), making them stand, moving their heads side to side with my line pressure, etc. And, I drove them for hours, until dark (a very Doc Hammill-like thing to do!). But while I was in the field, I just couldn’t get him to quiet down to the place that I wanted him, and to the place where he was last summer. At the end of our session that night (last friday), I decided to drive them home along the paved county road instead of through the field. Amazing thing: he was a quiet as could be. His head dropped, his energy went down, no attempts to trot, even when I turned them both directions. It got me wondering if somehow the field environment revs him up. Is it because it’s spring? Is it because of all the green grass? Is he associating being in the field with the run-away? Do you think he might just mellow out as summer comes on and he’s worked out his pent-up winter energy? 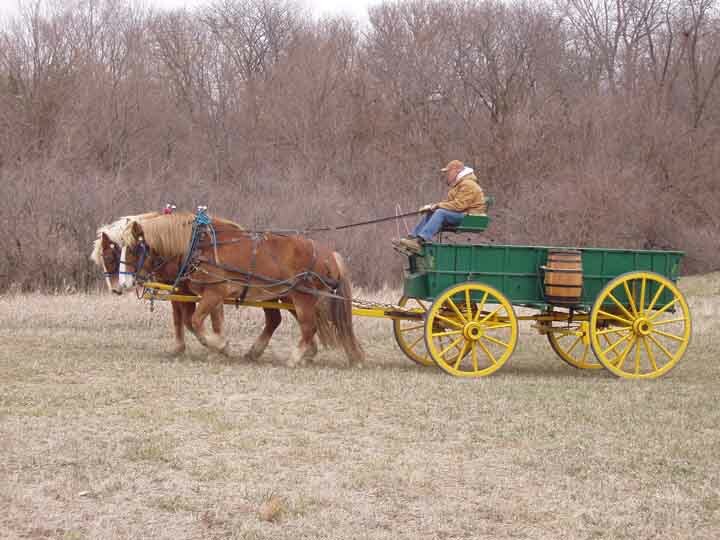 It didn’t matter which direction we were headed (towards the barn or away) when driving in the field – he still would try his trot routine on me from time to time. Certain spots in the field seemed more loaded energetically for him. None of them are where we had the run-away, but they do seem consistent – like he tries to break into a trot in the same place frequently. It didn’t matter whether I had weight on his collar or not – he was the same whether pulling the cultivator or ground driving around the field. Barney is the dominant horse. That said, I do my best to make every moment a training moment with them and assert my own dominance daily. He has very good ground manners. One thing I’ve noticed when he tries to break into a trot: he tucks his head even tighter to his chest and lets out a little stifled squeal/snort. Sometimes he even tries to kick his heels up a little (not a buck – more like a little heel kick, sometimes to the side….he’s on the right, so he sends his back end out towards the right, away from the tongue). When I was driving laps around the field, I would vary my pressure so as not to have them harden up on me. If Barney was trying to trot, I would use long, firm see saw strokes. When he quieted down I would reward him with less pressure and quieter, gentler strokes. When I fed them today (Sunday) I noticed that he had little dry skin tags at either corner of his mouth (not scabs or sores), but just flakes of skin that came off – maybe from all the bit rubbing on Friday? It didn’t look sore or raw, but it concerned me. I don’t want to have to put that kind of pressure on him, and it also wears me out! Farming is tiring enough as it is! I don’t know what to do to break through this behavior in a gentle effective way and would love your insight. I plan to get a smaller collar for him, and maybe try a fat, smooth bar bit on him instead of the snaffle. Someone suggested I should put him on a heavy load and just let him burn it off, but I am hesitant to work him too hard when he’s still soft from winter. Would driving him single help? Round pen work (I don’t have a round pen, but maybe could improvise with portable fencing)? More of the same? I’ll admit that I am reluctant & afraid to put him on something like a disc or plow right now – after my run-away experience, and given his energy of late. 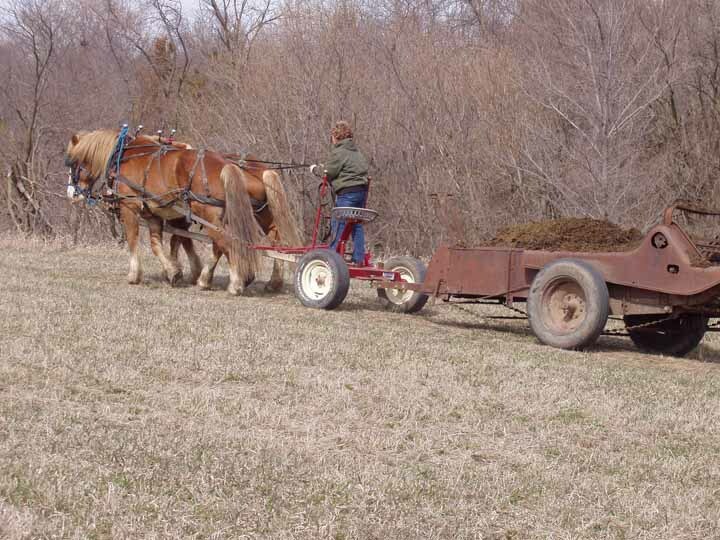 The tough thing is that I’ve got LOTS of that kind of work on the farm right now. 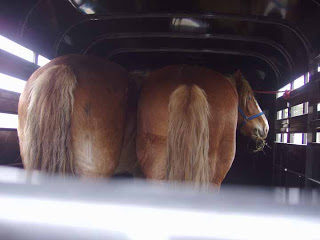 I want to do it with the horses, but I want to do it safely. I don’t know what Barney is trying to tell me, and until I understand it better, I’m stuck with the stinky loud tractor to get the jobs done. I’m looking forward to your insight. 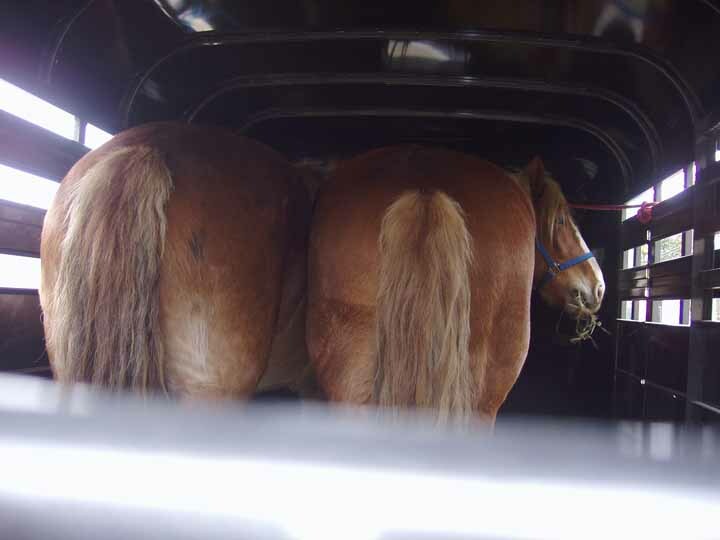 I will second Doc’s comment that we shared a Wonderful Day with Mary and her Donks. Mary has done such a great job exposing her donkies to all the activities and elements she could think of to make them good driving partners. She has worked with them in a deliberate and gentle way, and really used the information she learned at the Happ’s Workshop with John Erskine and Doc in 2007. She obviously has spent many hours ground driving each donkey individually and had put each to a single cart as well. It was great to be there on the first day she put Thistle and Tumbleweed together on the wagon, the culmination of much work and a big dream. I am grateful to have been a part of that day! Mary’s determination to do her training the right way was evidenced by her use of a booklet she referred to as she worked to put the harness on correctly. Mary has hitched the pair since and she emailed me this week to say she was thankful for the pictures we took that first day with the lines hooked correctly as Thistle had eaten the ‘lines’ page out of her booklet that afternoon! Gotta love those donkies.